The Bentinel Book is Now Available! We are pleased to announce that The Bentinel book is now available! 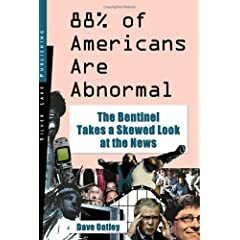 "88% of Americans Are Abnormal -- The Bentinel Takes a Skewed Look at the News" is available at Amazon.com and other booksellers. This first compilation of articles from The Bentinel covers world news, politics, entertainment, religion and more in the same satirical style you've come to expect. We hope that you enjoy this book yourself, give it as a gift to your loved ones (or hated enemies), use it to prop up unbalanced table legs, whatever strikes you. The Bentinel book is here to meet all those needs and more. Everyone here at The Bentinel would like to thank Silver Lake Publishing for their kind assistance in making this book possible.